Feather Light Guitar Body - Haywire Custom Guitars-Highly Recommended! Feather Light Guitar Body 3.5lb.Loaded Baked to a Golden Crisp Strat Ash Body+7 Sound Switching Included+Treble Bleed+ Working Bridge Pickup Tone Control. All pre-wired electronics,+ Pickguard + NEW SRV Pickups+Tremolo+Neck Plate and Screws included. Guitar We Ship World Wide! “Building satisfied players one Haywire Custom guitar at a time!”Light weight, great tone and sustain with lots of resonance. Modified Feather Light Strat Body + SRV Pickups Included 5 Way Switching includes-3 Single Coil and 2 Humbucking Modes ! This mod keeps the tone you have on “10” throughout the entire range of the volume control. We add a resistor capacitor network to the input and output of the volume control to keep the highs from leaving your tone as the volume is decreased. By adding this circuit we can help you avoid the “muddy-tone” syndrome. Now your tone is much more controllable and articulate when rolling down your volume! 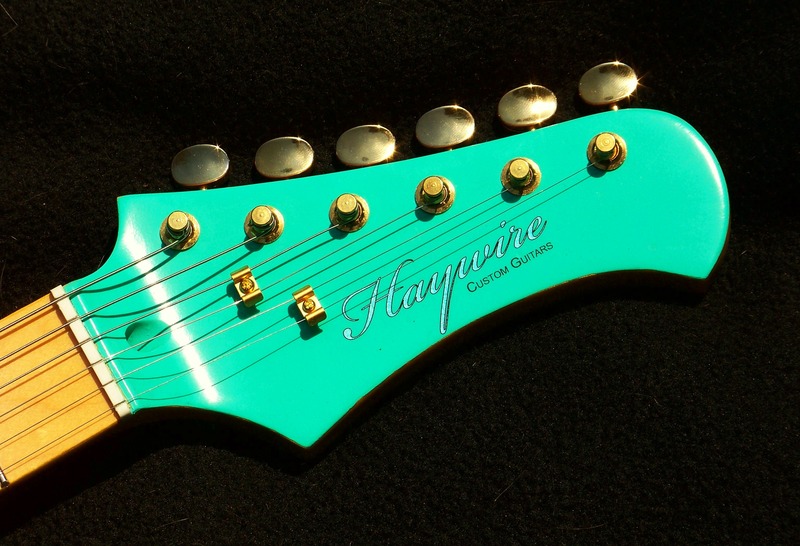 Turning the volume control applies varying amounts of a specially tuned high frequency filter to the selected pickups. Now each pickup has the ability to produce a stronger, fuller tone and 50% less noise. This variable treble bleed circuit is pre-installed. This variable treble bleed/bypass circuit corrects the problem of high frequency losses, provides auto-adjustment of tone at reduced volumes and improves audio taper between 3 and 10. Feather Light Guitar Body HAS A WORKING BRIDGE TONE CONTROL ! In MOST Fender Stratocaster guitars the tone control doesn’t work for the bridge-only pickup on a Stratocaster. It works on a few, approximately 1% of Stratocaster guitars whether made by Fender or by Squier, or Affinity, Fender Japan, Fender Taiwan, Fender Mexico, Fender Korea, American (circa 1991) or Fender China and more have no tone control on the bridge pickup. The tone controls do work for the other four switch positions. It was just a design that was only meant to please the inventor, Mr. Leo Fender. Leo wanted a pickup position that sounded similar to a steel guitar. So now in Fender guitars the bridge pickup selection has no tone control wired to it whatsoever and no one at Fender Corp. since then has seemed to notice. They have failed to hear what guitarists for years have asked. Can we simply have a tone control on our bridge pickup? YES. USA-Custom Shop 7 Sound electronics: Translation-Standard Position 1 of the 5-way selector switch activates the bridge pickup alone; by engaging the toggle switch, you will activate the neck pickup giving you the bridge and neck pickups together. Likewise, with the 5-way selector switch in the second position with the bridge and middle pickups activated, a flick of the toggle switch adds the neck pickup to the equation which gives you ALL of the pickups together. Two choice now missing on a stock Strat. Here’s what you’ll get after we added the 7 Sound Toggle Switch between the Tone Controls :Position 1-Will give you tones and sounds reminiscent of the“Byrds” Rickenbacker tone. This guitar body has a very warm and crisp sound. It is built light and resonant for sustaining notes. The treble bleed circuit keeps it clear with a good strong signal all the way down. You can add extra bass with the tone controls. The middle pickup is a RWRP which is wired like a humbucker in positions 2 and 4 on the 5 way switch. Overall a great choice for many styles and genres. Because of it’s very light weight, it is extremely and comfortable to play all night long. This Custom Classic Body with Vintage SRV Pickups is a dream to play all night long. It includes a…..Professional Setup for a working musician. guitars with distinctive switching and control options to powerful, tonally versatile pickup configurations by a variety of some of the best Pickup Makers in the U.S.A.5 Way Switching includes-3 Single Coil and 2 Humbucking Modes! If you like Stevie Ray’s Sound-You’ll love these HOT Vintage Pick ups with vintage style magnets! These Custom Stratocaster Vintage HOTSRV Pick ups added give it a Stevie Ray signature sound in any amp!